Sometimes understanding certain terminology thrown at you can be hard, especially if you’ve never heard of “amortization” before or thought balloon mortgages were actually mortgages on balloons. 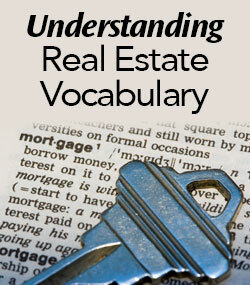 Having a basic understanding of important real estate terms before jumping into the homebuying, or even homeselling process, is a crucial step in making sure that you are as informed as can be during any real estate transaction. This is, essentially, a “good faith” deposit. The buyer will give a predetermined amount of money to the seller in question to affirm their interest in a property. This money is then put towards the buyer’s down payment when the transaction is finalized. Should the deal fall through however, the buyer may or may not be able to reclaim their earnest money deposit, depending on stipulations written out in the contract. Make sure you fully understand the terms of a legal agreement before signing it, so that you are not blindsided. A pre-approval letter tells you how much money you have been given by the bank to borrow, which also works in “good faith” to assure real estate agents and sellers that you have the funds to begin looking at properties on the market. In order to receive a pre-approval letter, you first need to complete an official mortgage application and then give the lender sufficient information to do a full background check on your financial history and credit rating. Most lenders today will reserve the lowest interest rates for customers that typically have a 740 rating or above. Contingencies act as a safety net for both buyers and sellers. These are stipulations in a contract that the buyer and seller must agree on before the final sale can go through. These criteria, or contingencies, usually fall underneath three categories: appraisal, home inspection, and mortgage approval. A seller might entertain other offers, but he or she cannot officially move on to another applicant until the contingent offer is finished in one way or another—whether through canceling the deal, or closing it. Sale of Current Home Contingency. If the buyer is unable to sell their current property, they can legally back out of the purchase contract and get their deposit back. However, it is very rare a seller will accept this type of deal, unless it is a final resort. Clear Title Contingency. A title is essentially a list of past and current owners of a certain property. Sometimes, issues will arise with the title such as liens, disputes, and other issues. If, in the case, these issues cannot be resolved, the buyer has a way out of the contract. Try to negotiate with the seller. Some sellers are willing to lower the sale price to offset the heavy burden of closing costs. Others may be willing to assume a percentage of the fees. This usually depends on the urgency to sell the home and the state of the market. Delay your closing. Sometimes fees are minimized merely by closing at the end of the month rather than at the start. A multiple listing service is a collection of databases that only real estate agents have access to. Here, they can see one another’s listings of properties for sale, thus creating a symbiotic environment of sorts, where listing and selling brokers can collaborate and share commissions. This is particularly advantageous to the homebuyer as well, as their agent can inform them on all available properties in the area, along with personal contact information for the seller and even private showing times. Unfortunately, if you are looking to do ‘for sale by owner’ and take the home selling process into your own hands, you will not be able to use the MLS unless you enroll in a flat fee MLS program. Amazon Course Reviews – How Important are They?